The halcyon days of luggage porters, steamer trunks and proper passport control (the stamps and stickers issued with pleasing regularity) may be long gone, but the modern traveller can still carry the right bag, a British-made, artisan-crafted investment piece that will serve grandfather, father and son alike. We may be subjected to spartan flying conditions but luxury luggage can soften the blow. 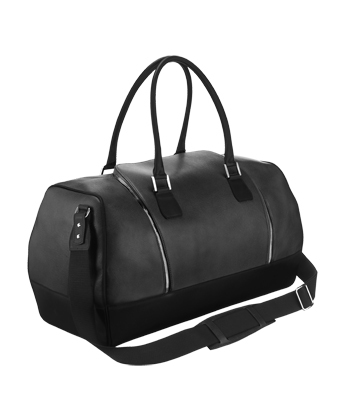 The holdall – an iconic British bag – is a foundation piece to which grander elements can be added as time and wallet allow. The British bag is an essential piece of kit. Make sure you get the right one. Trunks are the grand dames of luggage. Every house will have at least a brace of worn but eminently romantic-looking trunks tucked away somewhere. These are not made to lug to the self-check-in. Think cruising, a motoring tour, private jets and chartered yachts. The destination could only be elegant and sophisticated for the traveller with a luxury Williams British Handmade trunk (£8,500). They are made by Sarah Jane Williams. 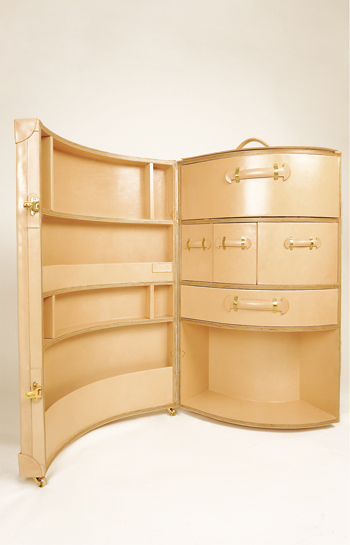 Lee Coleman, managing director of Quintessentially Gifts, says, “She produces a luxury luggage collection that’s wonderfully twisted, albeit functional.” Williams’s pieces are startling and exquisitely crafted. The Arch case (£4,600), like the trunk, is made from bridle leather and hand stitched with every element made by craftsmen in the UK. These are working artefacts. 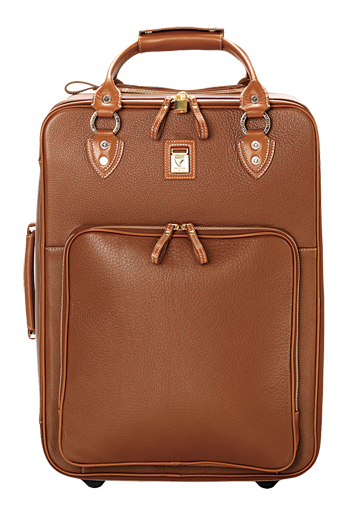 “Williams’s luggage is a luxury twist on the original, a modern-day edge with vintage touches. They’re popular with people who travel extensively, and the interesting shapes and sizes make packing easier and crease-free,” says Coleman. “The first scratch is a heart-breaking moment,” admits Tom Williams of Swaine Adeney, “but our London Tan leather patinates beautifully. It also looks wonderful when it has been battered and bruised a bit with age. 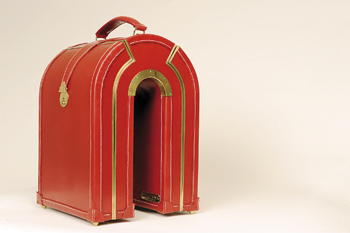 Then the luggage has a tale to tell.” The best-selling Swaine Adeney Chesterford (from £2,195) is a lovely hybrid, a steamer trunk-wheelie case cross. 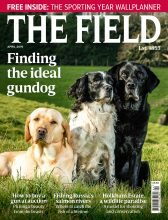 “The Chesterford has been a part of the range for over 30 years, but about 10 years ago we started to make them with trolleys, and the trolley is now standard,” Williams says. “It is our best-seller and comes in four sizes, from carry-on to 30in.” It is achingly covetable, made by one person in a workroom of only 18 to 20, by hand and in conjunction with an 1870s stitching machine – one of only two left in Europe. It evokes the best of British. “We are not all things to all men, but we do offer pieces that last lifetimes,” Williams claims. The 19in Swaine Adeney Cambridge holdall (£1,250) is based on a Twenties design and screams Bright Young Thing en route to Cap Ferrat, even if you are only going home to see your mother. HM The Queen took a Globe-Trotter suitcase on honeymoon, and the company boasts a reassuring reputation. “Social influences have a huge impact,” says Coleman. “Downton Abbey and the Diamond Jubilee – where vintage is key – mean everyone wants to feel and look the part.” Established in 1897 by Englishman David Nelken, in Saxony, the company moved to England in 1901. It still produces luxury, timeless travel icons. 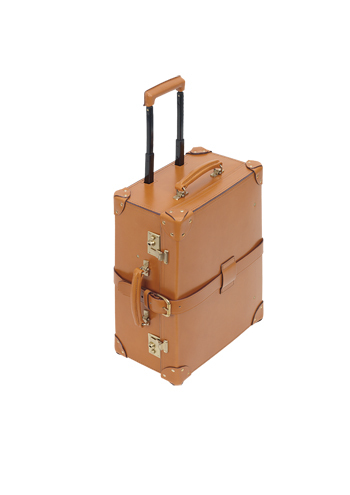 “Globe-Trotter suitcases are made from vulcanised fibreboard, a material invented in Britain in 1859,” says Coleman. “The leather is sourced from British tanneries and suitcases are made by hand at the factory in Hertfordshire using original Victorian machinery.” Globe-Trotter makes a range of cases in various materials, but the safari series trolley case (in colonial brown or ivory with natural leather corners and belts) is perfect for the adventurer. They range from the 18in (£760) to 33in (£1,115). 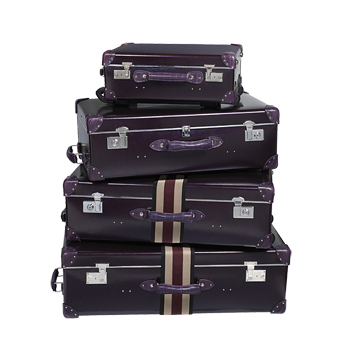 Globe-Trotter also makes the Asprey Londoner, in Asprey metallic purple with purple crocodile trim, signature Asprey lock and removable webbing luggage straps. It comes as a traditional suitcase and trolley. The 30in suitcase costs £2,400. Another wheeled wonder is Aspinal of London‘s Candy Case. It fits the stringent carry-on requirements without relinquishing quality. The Amazon brown croc and the tan pebble, both £695, are perfect for the serial overseas weekender. 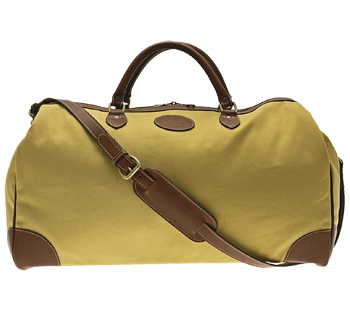 While trunks and suitcases are all very well, the traditional mark of a sporting chap is the English holdall, fit for everything from stalking weekends to sharking trips. No one should be without – and if you are still lugging a tattered rucksack from pillar to post, take heed. An Ettinger holdall is “soft on the eye”, claims Robert Ettinger of the family firm Ettinger, which has a factory in Birmingham. “We don’t go in for seasonal bling,” he says regarding his company’s classic products. “There are no chains or whistles. The design for the holdalls just works, as it has done for the last hundred years. Although modern technology has meant more modern materials are used, the manufacturing process is largely unaltered.” The Hurlingham (£496) and Cotswold (£562) in olive or sand drill and Havana leather are top in class. Made from two layers of cotton drill with a waterproof membrane in between, they have pockets and dividers inside and a carry strap. “The perfect holdall should be an old friend, something you have used for 20 years that has travelled all over the world with you.  People still bring in Ettinger bags that are 40 or 50 years old for us to repair,” he says. “By owning a Tusting product, you become a valued member of our extended family,” says William Tusting of his family’s products. “It’s personal!” Tusting bags are hand-crafted by a team of leatherworkers in a Bedfordshire factory. They know their stuff, with more than 130 years’ experience of tanning, grading and trading the world’s finest leathers. “The Tusting Gladstone bag was developed for the film The Importance of Being Earnest, starring Judi Dench and Rupert Everett, and has remained a best-seller ever since” says Tusting. 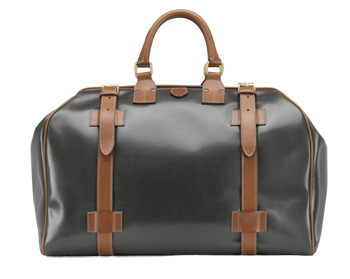 “It is a classic English holdall, the perfect size for weekend getaways in the countryside or the Côte d’Azur,” he says. “I always take a medium Explorer holdall [£430 in full-grain leather] when I travel.” The Explorer comes in canvas, leather, suede and kudu suede. Baker is fanatical about functionality and design, and every detail is well considered. These quirky references to British culture look set to stand the test of time. No luggage collection could be complete without a tweed bag. 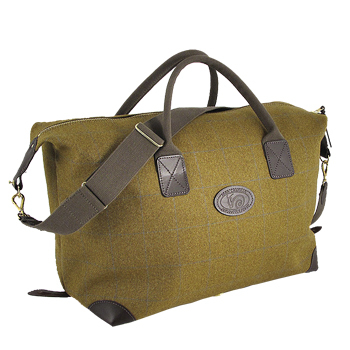 John Chapman‘s tweed holdall (£295) is good value and is made in the Chapman factory in Cumbria. The specially designed Border tweed is woven near the factory. “It is bonded with a cotton lining and a natural rubber core to form a handsome, durable and waterproof material. The bag is designed to be expandable through fastening the main flaps up or down,” says director Daniel Chamier. No-nonsense, hard-wearing and British, it is up to any weather and rigorous check-in procedures. The only bag you need is one that will last a lifetime. In an age of disposables these bags buck the trend and they are the best of British.